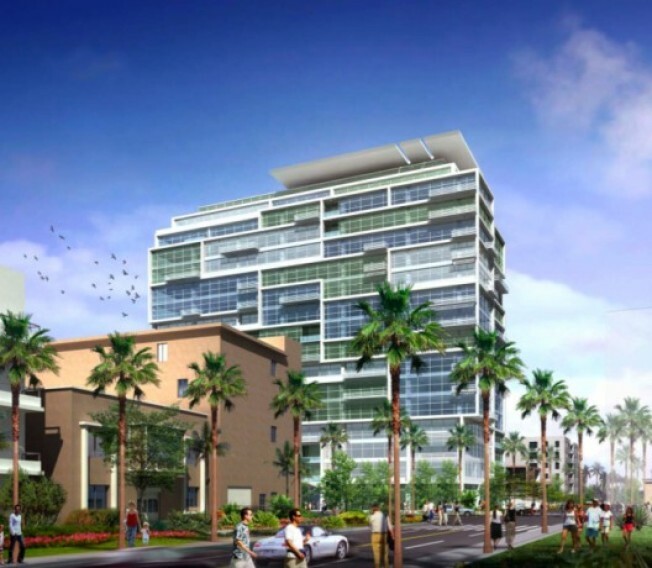 Meet the Wetherly Project, a very large development planned for a swath of land around S. Wetherly Drive and Almont Drive, right near the Four Seasons Hotel. According to city planning documents (the project is in the environmental impact report stage), the development "would demolish 84 existing apartment and condominium units in seven buildings and construct approximately 132 condominium units in one 16-story building (208 feet tall) and eight townhouse units in a three-story building (35 feet tall)." And 350 parking spaces will go in a subterranean parking structure, too. That big building in the rendering is the 16-story tower, but it's not immediately clear where the smaller three-story building is. If you're one of those who would lose their home over this, we hope there's a big buyout awaiting you. Oh, and the architect is Nadel Architects and they are looking for LEED Silver certification on the building.